When we picture Peter Cottontail hopping down the bunny trail, that path leads him to a garden of lush green vegetation, perfect for the nibbling. And not some dingy, oil-smelling airport parking lot. But at Denver International Airport, Peter and his pals have taken to chewing not on tender roots and heads of lettuce, but car wiring. Where’s that angry farmer when you need him to scare the bunnies away? CBS4 in Denver checked in with travelers who have a bone to pick with the airport, as many claim the brake lines, clutch lines and other wiring have been chomped on by hungry, hungry hares. That damage adds up, and insurance doesn’t always cover for rabbit attacks. “When I had the trouble with the oil light coming on, the dealer told me the wires that controlled the air conditioning were chewed,” said one car owner who says he’s had to have his car fixed twice because of the fuzzy little guys. CBS4 says it’s been on the case of the ravenous rabbits since 1999, back when they were dining on the wires of de-icing equipment. The parking lots seem to be their new cafeteria, but airport officials say it’s not really a problem, according to CBS, noting that only a small percentage of people parking in the lots ever complain about rabbit issues. 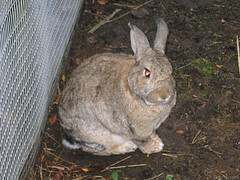 The United States Department of Agriculture Wildlife Services also has agents on patrol to remove any rabbits that pop up. We hope they drive around in cars labeled “Rabbit Patrol” but that’s probably too much to hope for.